Chinese actresses, Fan Bing Bing (范冰冰) and Li Bing Bing (李冰冰) both attended the 2013 Vanity Fair Oscar Party held in Hollywood, California on February 24, 2013. 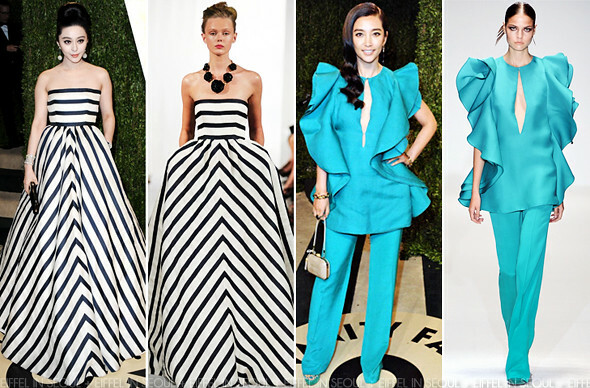 Fan Bing Bing (范冰冰) wore a striped ball gown from Oscar de la Renta Spring/Summer 2013 collection. Chopard jewels and Roger Vivier clutch to complete her rather toned-down look compared to her appearance at the Oscars. Li Bing Bing (李冰冰) wore a turquoise suit ensemble from Gucci Spring/Summer 2013 collection. Gold jewels and a minaudière to complete her beautiful look.